The MagSnoot is a crowd-funded snoot which can be attached magnetically to speedlights. A while back MagMod announced their MagSphere and MagBounce flash diffusers, for which the funding was achieved rather quickly through crowd-funding site Kickstarter. In the same campaign the company have now added the MagSnoot, a snoot that can be attached using the MagMod system. 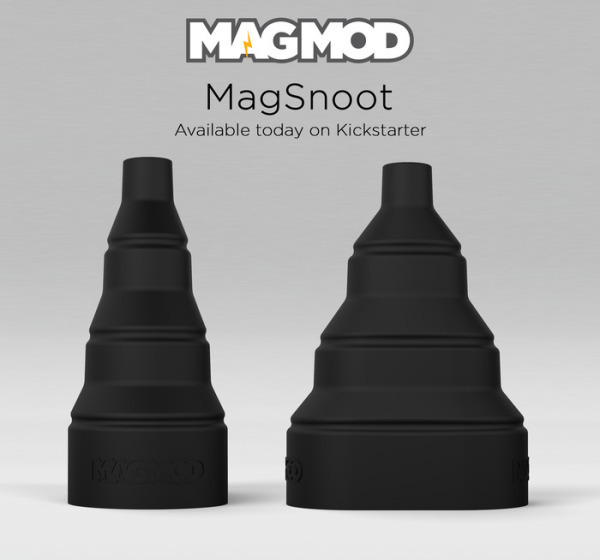 MagSnoot, like the other MagMod accessories is made from flexible rubber. It has a collapsible design which enables you to precisely control your light with 40°, 20°, 15° and 13° beam patterns. You can already buy a MagSnoot for $35. With only hours left at the moment of writing this article you will have to be fast, but quite likely they will be offered soon through the MagMod website as well. With the addition of the MagSnoot it seems that the MagMod system becomes more mature with a lot of different accessories. What is your opinion about it? Will you be getting a MagSnoot?